A few years ago, my mother was taking landscaping classes at a local junior college. They have sales to raise money for the department, and I bought this iris at one of them. It’s a native California iris; I forget the name. Supposedly, it does well in deep shade and needs to be protected from the sun. I bought it to go under an enormous cedar tree in our front yard. We cut down the cedar tree 5.5 years ago. 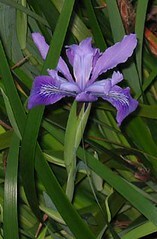 The iris survived the turmoil of the tree removal and has flourished in the HOT full sun of my front yard. Go figure. DH’s sweatshirt is all together. I decided the seams needed reinforcing with the sewing machine. There were too many skipped stitches. It is terribly thick fabric, the double faced windpro. The serger just isn’t up to the job. I wonder how it will do in the coverstitch department. I weighed myself, yesterday, and my weight was up to where it was before DH took the kids to Lake Tahoe. I know I’m not supposed to be trying to lose weight, but it’s all that I can think about. Anyway, I resolved to eat. I planned out my 3 meals and 2 snacks, and I stuck to the plan until I got home from work. DH calls and says that he’s not going to make dinner. Can we have Chinese? Sure. That’s fine. I’ll just have 1 serving, no seconds. He gets home an hour later than I expected. I’m starving, the kids are starving, I’m annoyed because he’s late and the kids are fighting, and I’m tired. HALT = Hungry Angry Lonely Tired. 3 out of 4 on that score card. So what did I do? I have my first serving, I went back for seconds, and I had thirds. Next time, I’m going to feed myself and the kids and not wait for DH to bring home food. Group was tough this morning. One of our members is depressed, suicidally so. She reminds me of me 15 or 20 years ago. I wish I could help her see how beautiful she is.